Pinball wizards - show your delightfully geeky colors with this little in-joke. Keep your badge, key card, keys, or other vital equipment stylishly and conveniently secure with this durable badge holder reel. Unlike the boring reels with quickly-fraying fabric cords you may have used before, this badge holder reel has a heavy-duty braided steel cable that can stand up to the most nervous fidgeters and fascinated 2-year-olds. It clips to your belt, pocket, or bag with a sturdy 1-3/8" steel spring clip and features a coin from the Safecracker pinball game, with a swivel-clip and steel cable that will outlast any normal retractable badge holder you've had before. Try it out, you won't be sorry! 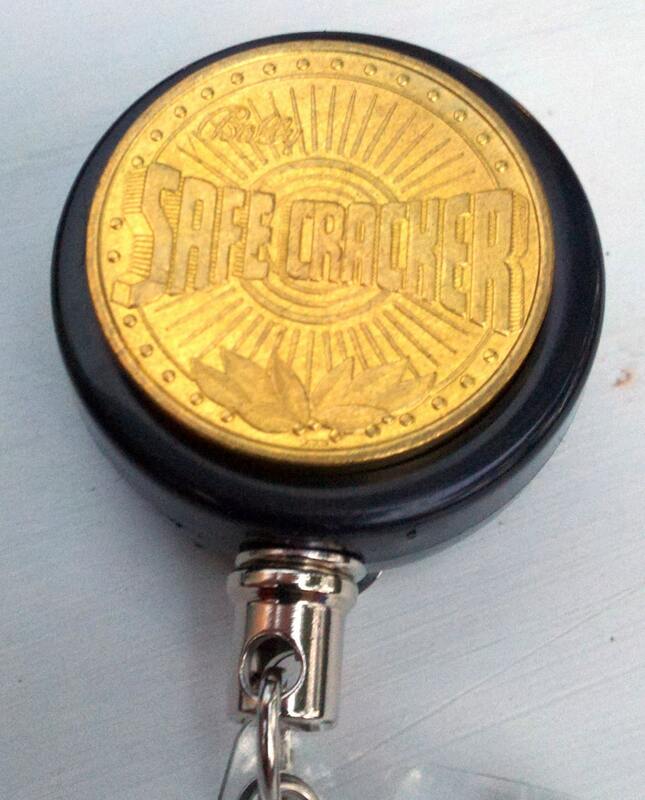 This is a limited run item - I was lucky enough to have a small cache of Safecracker coins made available to me, but once they're gone, they're gone! The heavy-duty braided steel cable is just like those used in industrial applications (albeit smaller than the ones used as tension members in bridges). Including the attached swivel loop and plastic badge holder strap, it extends from 2" in fully retracted mode to 24" fully extended, and the sturdy steel internal spring will keep it retracting smoothly through repeated use. The steel cable has an outer diameter of 0.04" and is coated with clear vinyl to protect it from the elements and from overuse. Its weakness is a potential to kink, so just don't tie it in knots and it will serve you well for a long, long time. "Fixed belt clip" is shown in action in picture #2. Sadly, I am unable to source a reel for this that has both the ultra-durable steel cable and also swivels against your belt. "Pinback," not shown, pins to your jacket lapel or similar sturdy fabric. The pin is oriented up-down. Keep in mind, this item is made to order and has a 48-hour curing time. It can take me up to 5 days to work through my orders. If you are in a hurry, please let me know! If you would like to specify which Safecracker coin you get, please refer to the legend in the 5th picture. Note that the version shown in pictures 1, 2, and 3 is the back of any of the coins, and that's also an option! If you don't specify, your badge holder will come exactly as shown in the first picture. This or any other badge holder reel can also be made using a metal spring clip or hook substituted for the plastic snap strap. I can also include a clear plastic ziplock-style badge or key card sleeve. I also offer gift wrapping and expedited shipping options. If you'd like any alterations to the item as listed, just let me know by clicking "contact seller" on the side of this page. See something you like, but you'd like it different, or you'd like more than one? See something I've sold and want a similar one? Want something completely different that I could make? Go ahead and ask, I do custom orders for accessories. Because of the nature of hand-made items, there may be small variations between the item you buy and the one in the picture. If you would like to pay via Google Wallet, go through the Etsy Checkout using "Other" payment method and then let me know you'll be paying with Google Wallet so I can send you a link. Love these! Beautiful and so useful being able to revove easily. Fast shipping. A great find. Beautiful....amber, Autumn bling! Love these. Fast shipping, and well priced. Silver color is a little warmer than I liked but cute and well made and as described. Really like the metal retractable wire. Please contact me for a custom listing if you'd like an order of more than 10 units! I offer discounts for large orders. If there's anything wrong with your item and you need to return or exchange it, it's extremely important you contact me via Etsy Convo first! For some issues, I may send you a prepaid return label when you contact me. For all issues, if you don't contact me first the package may get lost because I share my space with folks who don't always remember to tell me that a package came for me or where they stashed it. If I know it's coming I can keep an eye out and know to ask around. Please note, depending on the issue I may or may not be able to honor returns or exchanges on items that were made specially for you. Please contact me right away via Etsy Convo to discuss. My item broke, what should I do? The durability of my items is very important to me. If your steel cable badge reel or abacus bracelet has developed a problem, please contact me via Etsy Convo right away and send me a picture of what's wrong. Depending on the item and the issue, I may be able to repair it for you. If it's within 30 days of delivery and I can repair it, I'll send you a prepaid label to send it back to me for repair no matter where you are in the world. Will your abacus counting bracelet fit me? Probably! My counting bracelets are made from coils of memory wire that expand and contract around your wrist. If the width of your wrist measured flat at the widest point is between 2" and 3", the bracelet should fit fine with no alterations. If your wrist is particularly large or small, contact me about making you a custom version. I can probably accommodate you! Contact me via Etsy Convo to discuss. My turn around time for custom orders varies a lot, but for many items it's often about 3 weeks from when you pay for your custom listing. Please contact me via Etsy Convo to find out how long it will take for the item you want. During some times of the year you can pay a little extra to get certain items made up faster if I already have the materials on hand.